Sep 06, 2015 We appreciate your viewpoint and will address your general concerns, being unable to access your specific reservation due to the "Anonymous" nature of your complaint. All of our amazingly affordable promotions are sponsored and subsidized by the participating resort partner. In short, the resort partner is paying the 70% discount on your behalf when you meet the qualifications they set forth for these promotions. The resort partners just can’t open the door for everyone for these special promotions. In order to limit these promotions to the customers they are designed for, certain qualifications must be implemented. Therefore, certain "personal" questions are asked - such as - age, marital status, income. All qualifications, as well as any additional resort fees, taxes, and/or deposits which may be required by any particular resort are reviewed with each guest during the sales call - and are clearly stated, in writing, on the Terms and Conditions, which must be reviewed, agreed to, and accepted by all guests before the reservation can be finalized and forwarded to the resort. 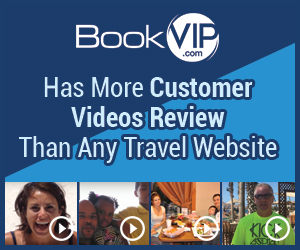 BookVIP has thousands of happy travelers every week, and has more video testimonials from happy customers than any other travel website in the world - our goal is to make dreams come true! Listen, they do not tell you until after you sign up that there will be a mandatory presentation you must attend. They conveniently say at the last min, "oh sorry did we not mention that??" They ask a ton of very personal questions on the phone. They do not inform you that wherever you stay there will be additional resort fees and deposits required. I spent $170 on my package and was surprised with $200 of additional fees when I go to the resort! I had called bookvip before going to the resort and asked specifically if there would be any additional fees when I checked in. I was told that there would only be a charge of $17 a day for hotel taxes which should have been mentioned when I booked as well! The taxes ended up being $84 dollars and I had to put down $150 deposit when I go to the resort! Preferred solution: Other people to be aware of this!!. Review #688857 is a subjective opinion of User688857.